Decision: How should I place my board to optimize Extreme Flank? In the above diagram, if your fighter is on a blue edge, they can only score Extreme Flank if your other fighter is on the green edge. Note that the bottom layouts are mirrors of the top layouts. This is important because the order in which you choose fighter matters. For example, using the left diagrams, if you have a fighter on p4 and a fighter on p1 you can only score extreme flank if you choose the fighter on p4 first. One final complication comes in the form of corners. If a fighter is in the corner of a board, she may have up to 4 opposite edges. For example, in the top left layout, if you first chose a fighter who was in the corner hex of p1 and p2, the opposite edges would be e1 and p4 vertically and e2 and p3 horizontally. 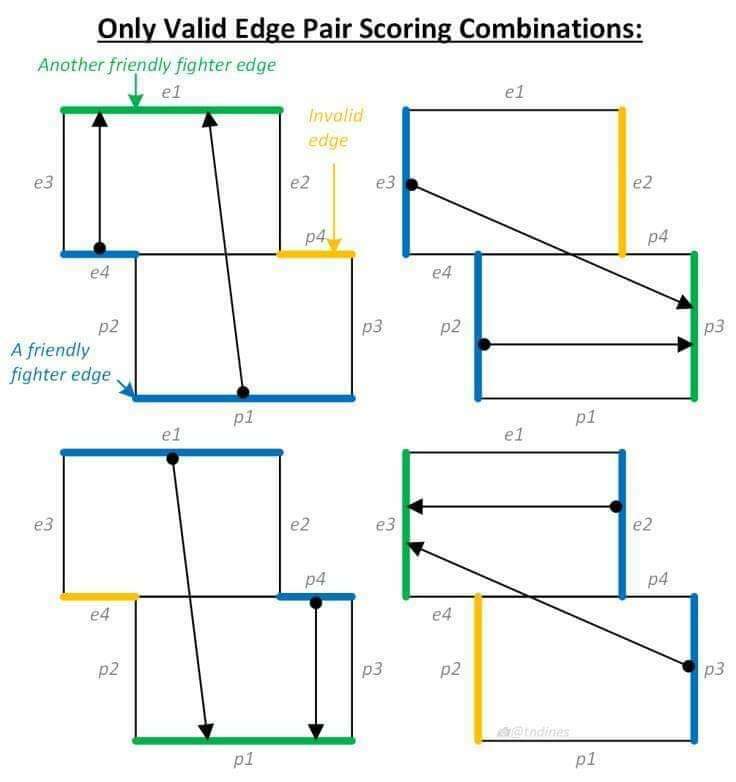 In this case, you could only score if you had a fighter on the further away of p3 and e1 (which can't be determined from the above diagram, but could be with real boards). To simplify, it's best to avoid corners when trying to score Extreme Flank. If you are planning on playing Extreme Flank, it's important to familiarize yourself with all the ways that it can be scored, so that you don't miss an opportunity for an easy 2 glory. Ideally, you will win the rolloff for board placement and make your opponent place their board first, but obviously that isn't going to happen every time. Therefore in this section we will attempt to identify 4 boards that are ideal choices for scoring Extreme Flank - 1) a board for when you lose the rolloff, 2) a board for when you win the rolloff and you prefer the rectangular (non-offset) short board setup, 3) a board for when you win and prefer the long board setup, and 4) a board for when you win and prefer the offset short board setup. The first thing you should consider when trying to set yourself up to score Extreme Flank is how to optimize your board placement. 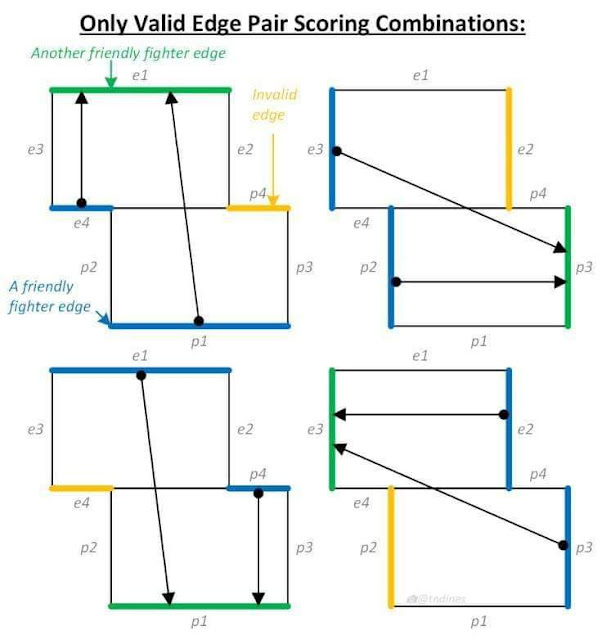 Two major factors can be looked at before even considering what's on the boards - the number of available edge hexes and the distance between/location of the two closest edge hexes. To maximize our chances of scoring Extreme Flank, we want a high number of options that are a short distance apart. Lets then examine 3 possible board setups when for when you do win the rolloff. This setup is often favored by aggressive players who want as many hexes to cross into enemy territory as possible. Unfortunately, this setup gives us the fewest edge hexes of any possible board layout - 34. Additionally, the closest edges are 8 hexes apart - longer than in any other setup. On the upside, non-offset board setups are much less likely to result in arguments from opponents who aren't quite sure how Extreme Flank works. Overall, this setup is not ideal for scoring Extreme Flank, but other considerations may outweigh the disadvantages for some warbands. This setup is usually favored by defensive decks who want to minimize interaction with the opponent. It also offers some advantages for players seeking to score Extreme Flank. First, this setup provides 38 edge hexes, four more than the rectangular short board setup. Second, the shortest distance between opposite edges is only 5 hexes. Finally, as mentioned above, this setup does make it more difficult for your opponent to interfere with your plans by minimizing interaction (at least early in the game). Since we are seeking to maximize our options for scoring Extreme Flank, we should always offset by 4 hexes if we are going to offset the boards. Similarly to the long board setup, this configuration also places the nearest opposite edges 5 hexes apart. When viewed in a vacuum (before considering what hexes are actually on the boards), we should always choose the maximum offset short board layout if we are attempting to make it as easy as possible to use Extreme Flank. 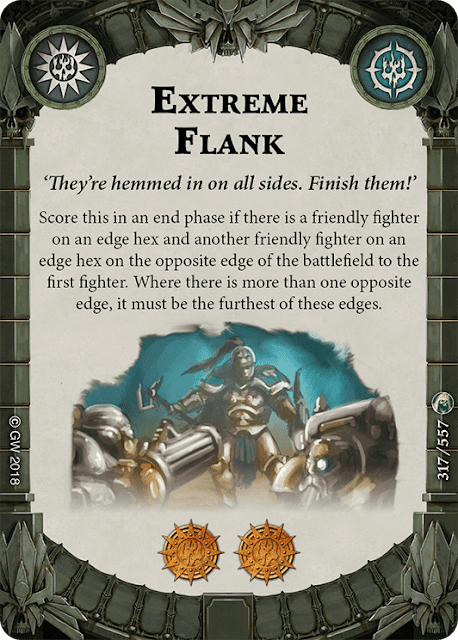 Now we'll look at the hexes on the boards in order to help us to choose the best one for scoring Extreme Flank. In an ideal situation, we want to use as few resources as possible to score Flank - meaning as few activations, movements, cards, etc. Therefore, the best boards will allow us to use starting hexes to start out in a position to score. As noted above, corners complicate things, so we will be valuing starting hexes that fall on corners at a lower level than those that lie in the middle of edges. Additionally, we probably want to avoid boards that have blocked or deadly terrain on the edge hexes. Let's start with the worst case scenario - losing the rolloff. Since your board could end up in any configuration when we lose the rolloff, an ideal board for this setup would have a starting square on each edge, none of which are in corner hexes. 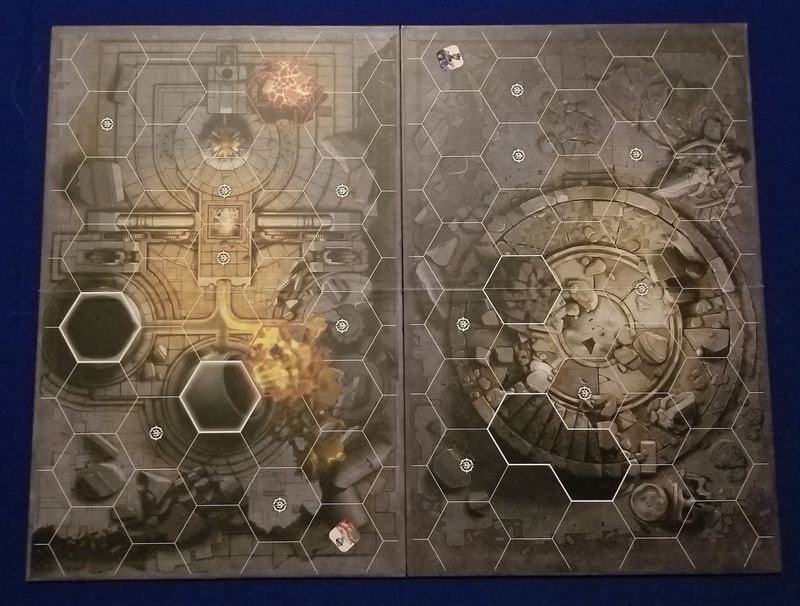 Of the 10 board options, Games Workshop has been kind enough to provide us with exactly one board that fits the bill - #7 in the above photos. As a bonus, this board has no blocked or deadly hexes on the edges, and actually provides you with two edge hexes on one end (this particular model also features a Chase sticker from Paw Patrol). No matter which way your opponent tries to manipulate this board, you'll always have at least one way to trigger Extreme Flank from your starting positions. Not bad. If you win the rolloff and prefer to fight on the rectangular short board setup, #7 is still probably the best choice, as it provides starting squares on each of the "side" edges for you to trigger Flank with as well as a decent array of forward starting hexes to place your aggro models on. The only other board that features usable Flank-friendly starting hexes for this configuration is #9 (with the board positioned so the triangle of blocked squares points at your opponent), and it's not nearly as compatible with the aggro strategy. The long board setup turns everything on its head, so to speak, as we'll generally be looking at the boards from the perspective of defensive warbands. Boards #2 and #10 are out of the running completely, as they don't feature a starting hex along one of their long edges (which will form the "sides" of the battlefield). #6 and #8 are similarly out because the only starting hexes that are on one long edge are also in a corner. 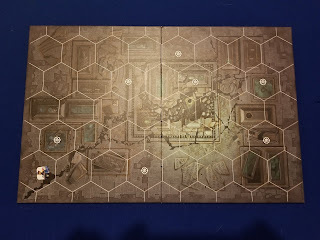 You could still make these boards work if you absolutely had to, as you could place the corner hexes against your opponent's board, but you would have to then place your model right next to no-man's land; not a great plan for a defensive setup. Of the remaining six boards, two of them (#4 and #5) offer pairs of starting hexes on each long edge. Unfortunately, one of those hexes is in a corner on board #4. In this case, #5 is the clearly superior board. 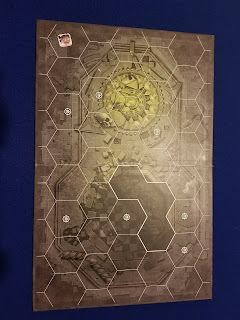 Additionally, #5 offers some blocked hexes for cover, and a great array of rearward starting hexes (assuming you place the blocked hexes closer to you) to start your defensive army on. As an extra bonus, when oriented in the long board set-up, the starting hex marked with the yellow star is somewhat resistant to your opponent's push effects. A push that moves figures only a single hex (including the dreaded Great Concussion) can't move a model off the starred hex in such a way that it won't still be on an edge square - all but guaranteeing that you'll meet 1/2 the criteria for Extreme Flank. 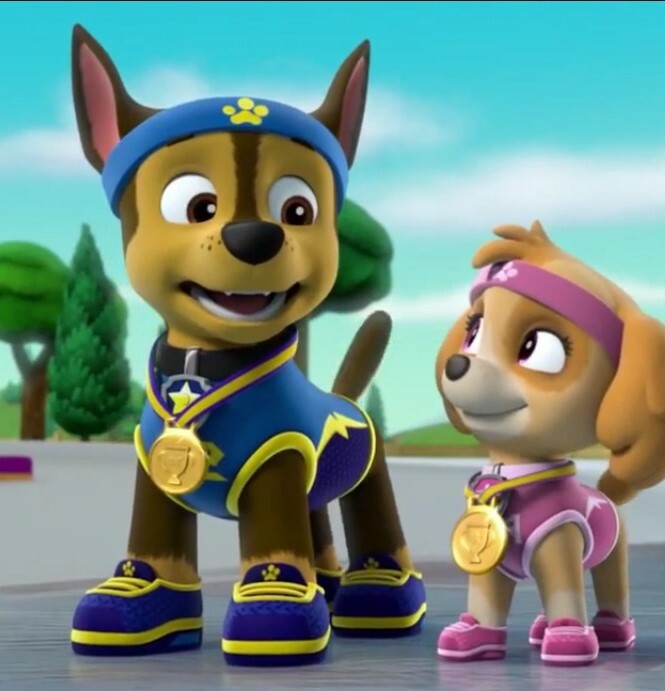 Finally, this board features an adorable sticker of Skye from Paw Patrol (your particular board may be lacking this feature). The final scenario we want to look at is one in which you win the rolloff and want to place your board in the offset short board setup. As mentioned above, you should maximize the amount of offset to facilitate Extreme Flank. As such, we'll be looking for a board that - when in the maximized offset - allows us multiple options to score Flank, preferably along the edges that are closest together. Once again #2, #6, #8, and #10 are out of the running for lack of starting hex options. 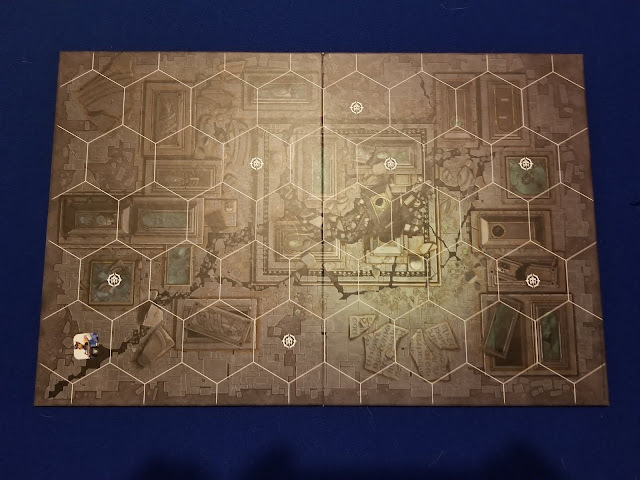 Of the remaining boards, we should look for one that provides at least 4 starting hexes that lie on opposing edges from each other. That eliminates #1, #3, and #4. Board #9 initially looks promising, but one of its 4 eligible starting hexes is a corner, so we'll toss it too. That leaves us with #5 and #7 again - but which is better in this situation. That's a tough call; #7 actually provides five starting hexes that fit the bill and can score Flank 2 different axes. 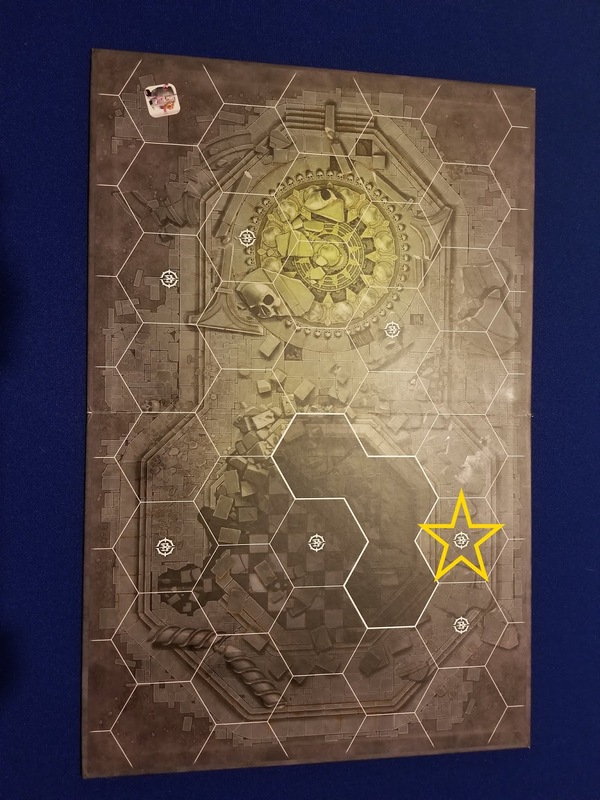 Board #5 has the advantage of the "unpushable" starting hex discussed above, and both of its scoring opportunities lie along the shorter axis of the board. 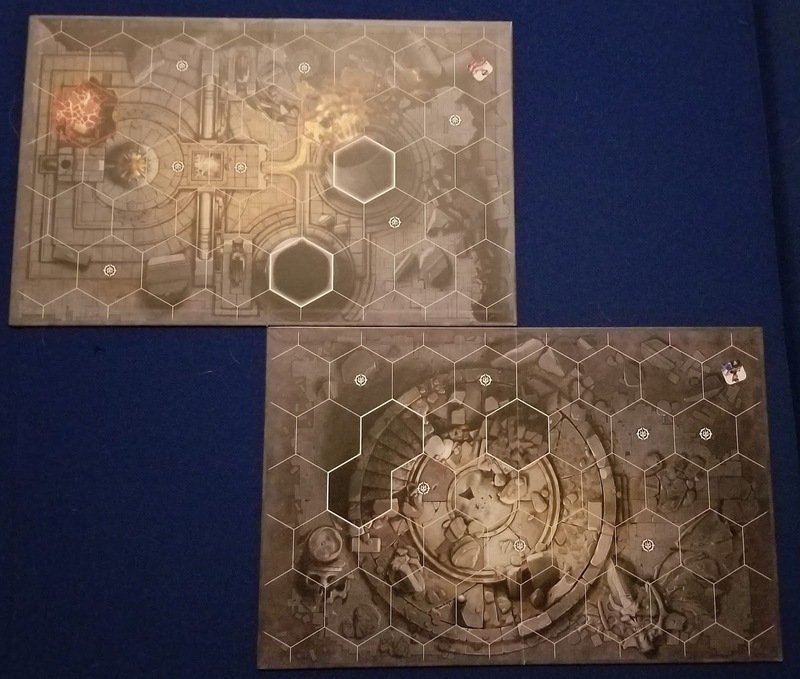 Since any advantage of having five eligible starting hexes is negated by any warband with four or fewer models, in most cases #5 will again be the board of choice. If you have a lot of ranged attacks, more than five models, favor Skye over Chase, or just plain like it better, feel free to go with #7 here - there's not a lot of difference. Choosing your board solely based on how easily it scores a single objective probably isn't the best plan of attack. This article was intended to give you a heads up on which boards score Extreme Flank easily, and which don't. If one of these two boards doesn't fit your larger plan of attack, you should probably go with something else. There are lots of ways to score Extreme Flank: Hidden Paths, Faneway Crystal, Illusory Fighter, and - blood god forbid - actually moving your models. However, scoring two glory for literally doing nothing is pretty good, and hopefully this article has given you some insight into easy ways to set that up. 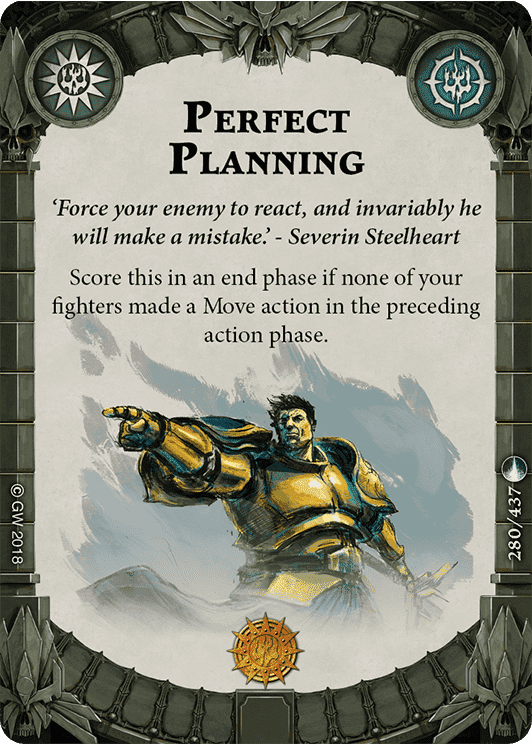 It's likely that defensive decks will get the most use out of Flank, and choosing board #5 (which was already a good choice for defensive warbands) allows you to combo Flank with other objectives like Perfect Planning. In order to maximize your chances of being able to score Extreme Flank, you'll want a layout and board that maximize the number of edge hexes, particularly those edge hexes that are also starting hexes. Of the currently available options, board #7 is best for this if you lose the rolloff or favor an aggressive style that prefers the rectangular (non-offset) short board setup. Board #5 is best for defensive long board setups and offset short board setups.